With NASCAR Hall of Famer Rex White in attendance, Atlanta Motor Speedway's Thursday Thunder Legends Series Presented by Papa John's Pizza, once again, put on an impressive show full of on-the-edge-of-your-seat action, leading to first time winners, and furthering already tight championship battles. 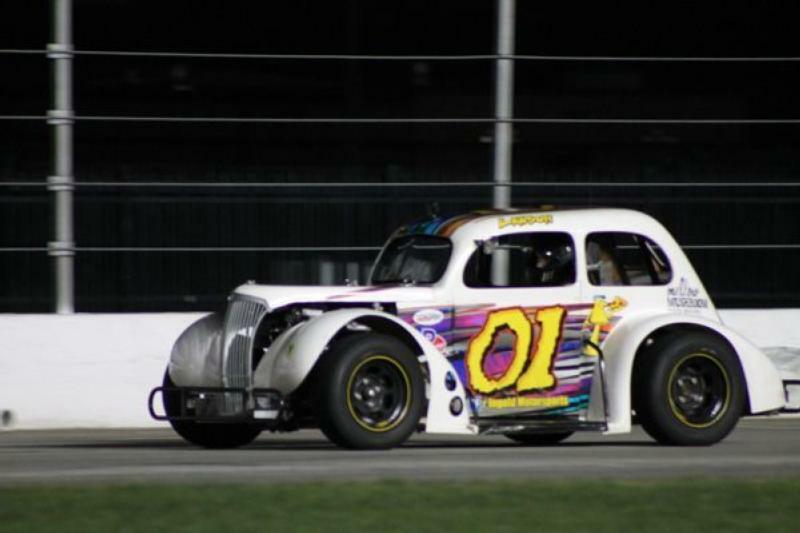 A three-car shootout feature in the Chargers Division kicked off the night. As the green flag waved, Buchanan native Zac Bacon took the lead position from Covington's Bob Anderson. Bacon ran away with the lead, keeping Anderson at bay until the checkered flag waved. The Masters Division took to the track after the Chargers, as the next episode of the championship saga took place. Locust Grove's Bill Plemons Jr. and McDonough's Robbie Woodall faced off at the start of the event. Plemons Jr.'s car took off like a rocket as he gave himself a two-car gap between himself and Woodall. Woodall tried to make a pass on Plemons Jr. on lap 16 when a lapped car got in front of his path, but Plemons Jr.'s car was just too strong. Plemons Jr. would go on to win his third straight Masters Division race of the 2018 season. "My car is running good thanks to my crew chief, Scott Moseley, explained Plemons Jr. "He's good to have on my team, I mean he knows what he's doing. He used to race here against me and whoop me every time, but now he's working on my cars and I'm just so very appreciative of it. He really has made me better." Plemons Jr. now holds a six-point lead over Robbie Woodall in the championship standings going into week five. The Associates Group Insurance Young Lions Division saw non-stop battles for the lead and a surprise victory. Ryan Rackley, hailing from Valdosta, took the lead from the start with Social Circle native, Lawson Ingold not far behind. Ingold made his desire for victory known as he made a pass in the grass of turn 1 to take the lead from Rackley on lap 3. A mistake between fellow competitors led to a restart, which Rackley took the lead back on. However, Ingold was not going down without a fight. Ingold regained his precious lead from Rackley on lap 8. He would continue to lead the field all the way to the checkered flag, and his first career win. Ingold was emotional after winning the feature, "I have so much adrenaline right now! I finally have the monkey off my back. This just feels amazing right now, I mean, after two years of struggling in this car, trying to figure this out, it finally happened!" The VP Racing Fuels Pro Division once again had fans on the edge of their seats as Eatonton's Rafe Slate took the lead at the drop of the green flag. Eyes in the crowd drifted to the rear of the field where Dawson Fletcher was lined up at the start. The young phenom from Canton made his way from the final starting position to Victory Lane last week and was looking to repeat his impressive feat. By lap 10, Fletcher had made his way to the top-5 battling Stockbridge's Jensen Jorgensen for position. Fletcher got a little too antsy when he spun Jorgensen out of his way. His actions sent him to the rear of the field, thwarting his progress. When lap 20 came around, Fletcher found himself comfortably in the third position, eyeing up prime position holder, Slate. On the final lap, Fletcher made his way to second, racing side by side with Slate in turn 3. Going into turn number 4, Fletcher pushed Slate a bit too far, causing both drivers to slide out of the groove. This incident opened the door for Cody Hall of Griffin to slide past both drivers and steal the victory. The Rookie Bandoleros had their time to shine on AMS' "Thunder Ring" as Dacula's Gianni Esposito led the way. Esposito maintained his lead for most of the bout until he slid into second place runner Lee Brown out of Acworth. Shelby Schell assumed the lead but struggled to keep up with Dallas' Bryson Matthews. Matthews took the lead from Schell and led to the very end of the feature. In the Bandits feature, Kelley Puckett of McDonough led at the start but could not shake second place car, Carson Ruark out of Suwannee. Puckett and Ruark exchanged the lead throughout the event but the final three laps belonged to Ruark. Carson Ruark would go on to earn his second win of the season. Johnston, IA native, Sammy Smith put the Semi-Pro Division on notice as he jumped out at the start as if he was shot out of a cannon. Although Smith got a strong start, Lagrange's Jason Treschl and Lebanon TN's Davis Rochester would not let him go so easily. Both drivers kept a close watch on Smith's bumper, but neither could quite catch him. Smith outran Rochester and Treschl, winning his second race of the season. However, after post race technical inspection, it was determined that Smith had a faulty charging system, leading to his disqualification. Therefore, Davis Rochester became the winner of the Semi-Pro Division event. The GRT Racing Driver Development Outlaws Division was slated as the final event of the evening. Blaise Maddox out of Locust Grove took command of the lead from the get-go and never looked back. He led from start to finish, defying all competition. The 2018 season continues with week five action next Thursday, June 28 for Church Night, where a church bulletin will get fans a special one dollar discount on tickets. The season will run each Thursday night through July 26, before wrapping up with a special-edition Saturday Championship Night on Aug. 4. Grandstand admission for the affordable, family-friendly Thursday Thunder Legends Series Presented by Papa John's Pizza cost just $5 per person, with kids 5 and under admitted free. For more information about both Friday Night Drags and Thursday Thunder, contact the Atlanta Motor Speedway ticket office at (770) 946-4211, (877) 9-AMS-TIX or visit www.atlantamotorspeedway.com.